Tomorrow marks fifty years since Princess Beatrix of the Netherlands married Claus van Amsberg. We'll talk more about that royal wedding tomorrow, but today, here's a look at the history of the tiara Beatrix wore: the Württemberg Ornate Pearl Tiara. 1839: Princess Sophie of Württemberg marries her first cousin, the future King Willem III of the Netherlands, in Stuttgart. 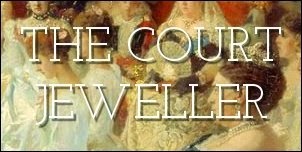 The new Dutch princess receives a tiara as a wedding gift, probably made for her by A.H. Kuhn, a local jeweler. Some believe that this tiara was an early version of the ornate pearl tiara now worn by the royal women of the Netherlands, but this has never been conclusively proven. 1849: Willem and Sophie become King Willem III and Queen Sophie of the Netherlands. Although they have three children, their marriage is a disaster, and the two eventually live separately for parts of the year. 1877: Queen Sophie of the Netherlands dies in The Hague. Her jewelry is inherited by her elder living son, the Prince of Orange. 1879: The Prince of Orange dies in his Paris apartment; his younger brother, Prince Alexander, becomes the heir to the throne and the owner of their mother's jewelry. The cache of jewels includes a diamond and pearl tiara, but no images of the piece are extant. The same year, King Willem III marries Princess Emma of Waldeck and Pyrmont, who becomes Queen Emma of the Netherlands. The following year, the new queen gives birth to her only child: Princess Wilhelmina. 1884: Alexander dies suddenly of typhus in The Hague. His younger half-sister, Wilhelmina, is now heiress presumptive in the Netherlands. She also inherits the jewelry that had belonged to Alexander's mother, Queen Sophie. 1890: King Willem III dies at Het Loo Palace in Apeldoorn. 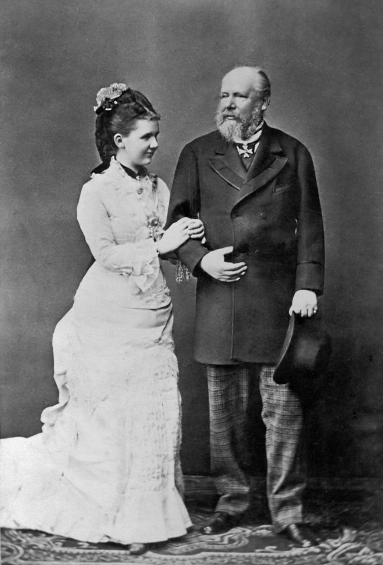 His ten-year-old daughter becomes Queen Wilhelmina. Her mother, Queen Emma, serves as regent for the young queen. 1897: The Ornate Pearl Tiara is created for the young Queen Wilhelmina a year ahead of her enthronement festivities. The piece, which is set with diamonds, 35 round pearls, and 11 pear-shaped pearls, was likely made by Royal Van Kempen en Begeer. Some have speculated that the tiara was actually a remodeled version of a diamond and pearl tiara from the collection of Queen Sophie, possibly that unseen tiara inherited by Prince Alexander. That's why the tiara is generally known as the "Württemberg Ornate Pearl Tiara," but the connection between the tiara and an earlier piece from Queen Sophie has never been firmly established. The 1897 tiara can be worn in four separate settings. Setting #1 (top) includes all eleven of the pear-shaped pearls attached to the top of the tiara in two rows: five pearls on the highest elements and six pearls on the lower ones. Setting #2 (bottom left) features just the 5 pear-shaped pearls on the highest elements. Setting #3 (bottom right) features just the 6 pear-shaped pearls on the lower elements. Setting #4 (center) is just the tiara without any of the pear-shaped pearl toppers. 1898: Queen Wilhelmina wears setting #2 of the tiara for her first set of official portraits as queen. One of the portraits from the session was featured on a stamp used throughout the first quarter of the twentieth century in the Netherlands. The tiara was apparently not a great favorite of Wilhelmina; these appear to be some of the only images available that feature her wearing the piece. 1901: Queen Wilhelmina marries Duke Henry of Mecklenburg-Schwerin. Their only daughter, Princess Juliana, is born eight years later. 1937: Princess Juliana marries Prince Bernhard of Lippe-Biesterfeld in The Hague. A year later, their first daughter, Princess Beatrix, is born. The couple would go on to have three more daughters: Irene, Margriet, and Christina. 1948: Queen Wilhelmina abdicates in favor of her daughter, who becomes Queen Juliana. Wilhelmina reverts to her previous title, Princess Wilhelmina. 1950: Queen Juliana wears setting #1 of the tiara during a state visit to the United Kingdom. 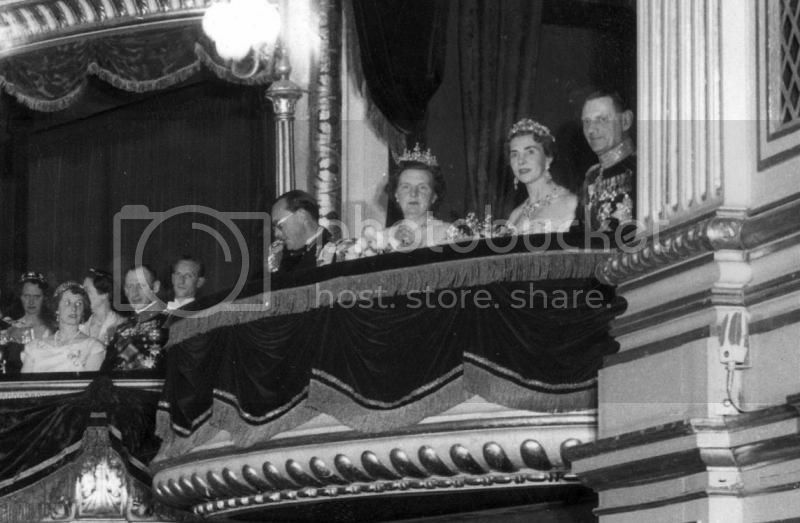 1953: During a state visit to Denmark, Queen Juliana dons the tiara during a visit to the theater. 1962: Princess Wilhelmina dies at Het Loo Palace. Her jewelry, including the ornate pearl tiara, is inherited by Queen Juliana. At some point in the 1960s, Juliana decides to place the jewelry in a family foundation, ensuring that it cannot be sold and will not leave the family through marriage or inheritance. 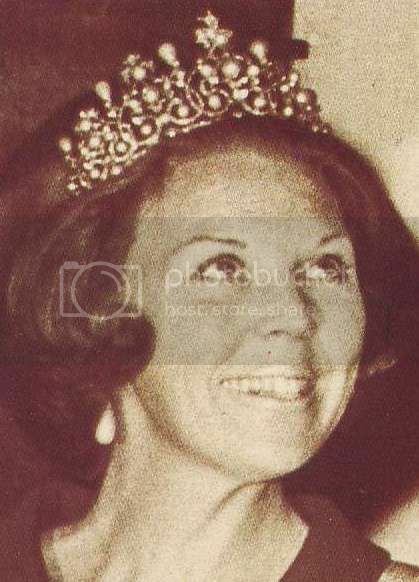 1966: Juliana's eldest daughter, Princess Beatrix, chooses the tiara for her wedding to Claus van Amsberg. She wears setting #1, the full tiara, with her bridal veil. 1975: Queen Margrethe II of Denmark makes a state visit to the Netherlands; Princess Beatrix wears setting #3 of the tiara during one of the gala functions. 1980: Queen Juliana abdicates in favor of her eldest daughter. Juliana becomes Princess Juliana; Beatrix becomes Queen Beatrix. 1982: Queen Beatrix selects setting #1 of the tiara for a state visit to the United Kingdom. 1994: Beatrix wears setting #4 of the tiara -- no pear-shaped pearls -- during a state visit to Austria. 1995: At a banquet at the Guildhall in London for heads of state commemorating the 50th anniversary of the end of World War II, Beatrix wears setting #4 of the tiara. 2001: Beatrix wears setting #4 of the tiara for a state banquet during the Spanish state visit to the Netherlands. 2010: Beatrix wears the tiara during a state visit to Norway. 2011: Setting #4 of the tiara is Beatrix's choice for a state visit to Germany. 2013: Beatrix wears setting #4 of the tiara during a state visit to Brunei. 2013: After more than three decades on the Dutch throne, Queen Beatrix abdicates in favor of her son, Willem-Alexander. At a gala dinner held the night before the abdication, Beatrix wears setting #2 of the tiara. The next morning, her son and daughter-in-law become King Willem-Alexander and Queen Maxima, and she becomes Princess Beatrix. 2014: Queen Maxima wears the tiara for the first time at a state banquet during the state visit to Japan. She chose setting #4 for the occasion. 2015: Maxima wears setting #4 of the tiara for a second time at a gala dinner for the diplomatic corps in Amsterdam.